When the Williams sisters meet at the quarter finals at the U.S. Open this evening they will each take home $410,975 in prize money just for making it this far in the tournament, according to USOpen.org. In addition to the intrigue that surrounds these famous sisters, people around the world are watching with great anticipation to see if Venus, the No. 23 ranked women’s player in the world, will stop Serena, the No. 1 ranked women’s player, from marching into the history books. If Serena wins the U.S. Open, she will become the sixthÂ person–male or female–to win all 4 major tournaments–the Australian Open, French Open, Wimbledon, and the U.S. Open –in a single calendar year. This hasn’t been done since Steffi Graf dominated the Grand Slams in 1988 when Williams was just 6-years-old. What isn’t spoken about as often, however, is despite the sister’s 22 point difference in the WTA rankings, they are Nos. 1 and 3 in all-time career prize money.Â Serena tops the list at $73,293,424 according to the WTA, and Venus is No. 3 at $31,007,596. Only Maria Sharapova–who has earned more than twice what Serena has made in endorsements–comes between the sisters, winning her way to $35,821,151. While everyone is waiting to see if Serena can join Steffi Graf in the record books, it’s interesting that Graf, who is No. 7 on the women’s tennis career prize earning list, won 22 Grand Slams during her career, compared to Serena’s 21 titles, and Venus’s seven. Still, they both far out earned Graf’s near $22 million in prize money. “It’s just a sign of the times,â€ says Martin Morse, CEO of the MM Group, which provides financial and business mentoring to elite athletes and high profile celebrities. In addition, Morse points out that advertisers are willing to pay more because they can take advantage of player’s social media platforms, which was not the case before Graf retired in 1999. As for social media, Serena is No. 1. She has more than 5.3 million Twitter followersÂ and more than 3.5 million Facebook Fans, compared to Venus’s nearlyÂ 1.3 Twitter loyalistsÂ and nearly 2 million fans on Facebook. 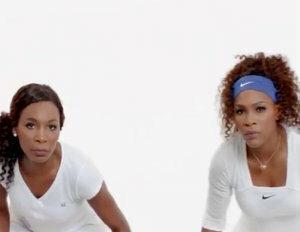 No matter which sister you’re rooting for, you can bet that social media will be buzzing, and advertisers will be watching closely, to see how they can catch a ride through cyberspace into the eyes and wallets of the Williams sisters adoring fans.